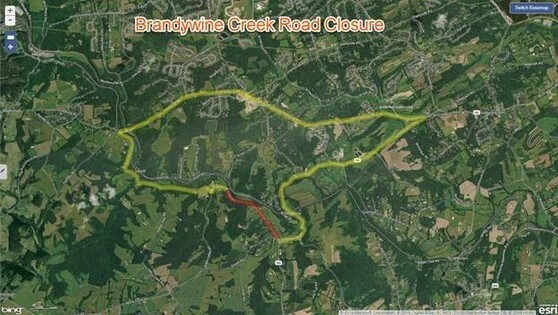 King of Prussia, PA – Brandywine Creek Road is scheduled to close in both directions between Green Valley Road and Powell Road on Monday, April 15 for the start of work to stabilize, restore and improve flood-damaged sections of the highway in Newlin Township, Chester County, the Pennsylvania Department of Transportation (PennDOT) announced today. Brandywine Creek Road has been closed to westbound traffic since March 2017 due to the instability of slope areas along the highway located near the West Branch of Brandywine Creek. Road-Con Inc. of West Chester, Chester County is the general contractor on the $5,616,723 project. Construction on Brandywine Creek Road is being financed with 100 percent state funds, while work on Balligomingo Road is being financed with 100 percent federal funds. Newlin Township sustained serious flood damage due to the storm that came through on April 30, 2014. Due to the flooding, Laurel Road is currently closed. Please check back for updates on the road. PennDot maintains Brandywine Drive, Brandywine Creek Road, Green Valley Road, Stargazer Road, Strasburg Road and Rts. 162 and 842 in our Township. If there is a concern or an issue like a tree down or a pothole, PennDot is who you call. The District 6 PennDot Maintenance garage is on Rt. 162. Their phone number is 484-340-3200. All the other roads are maintained by the Township. The State does provide funding for Township roads through our annual Liquid Fuels allotment which is based on population and the number of miles of Township maintained roads. The Supervisors try to budget those funds wisely in order to cover the work that needs to be done during the year on Township roads. Laurel, Youngs, Harvey's Bridge, Garnet, Wheatland, Scott, Powell, Hilltop View, Apple Grove, Cannery, Kelsall, Lost Trail, Marlboro Springs, Glen Hall, Oak Tree, Oak School, Indian Hannah, Beagle Club, Bailey Circle, Joshua Way, Wynchester Way, Newlin Greene Circle, Kimberwyck Way, Ground Hog College, Chestnut Hollow, Warpath and Galvin Circle. You may report problem to one of the three Supervisors of the township at 610-486-1141 or info@newlintownship.org.